Is it possible to share 101.4% of Facebook? Chart of the Day thinks so! There's a bad stomach bug going around this part of town and I think I might know part of the reason why. Today, my good friends over at Chart of the Day published this pinwheel pie chart and I think the filling might be bad, because the pie sure looks ugly. The dollar amounts are based on their portion of $100B, yet they total up to $101,350,000,000. Correspondingly, the percentages add up to 101.4%. How can you have more than 100% of a total? To highlight the differences, I created the following charts with Tableau. NOTE: A special thank you to Marc Reuter (@tableaujedi) for enlightening the ATUG crowd today with some Jedi magic and for showing how to use the TOTAL function. I had never used it before (and didn't know about it either), but I find it totally awesome! It'll be so useful! Basically, I'm taking the value stated on the pie chart and dividing it by the total value of the pie chart. This gives you the Restated % Share. The label is the difference between the Restated % Share and the Stated % Share. 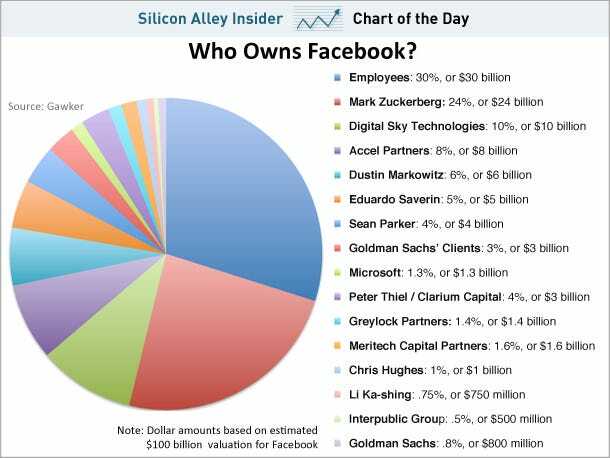 The chart on the right represents the % variance number (as identified by the label on the left) multiplied by $100B (the estimated total value of Facebook). If I were one of these shareholders, I'd be a bit concerned about the math. This isn't chump change! In the end, Chart of the Day may have made a $1.35B miscalculation. Oops!